There was a time when, if pressed, I would say that the most beautiful car ever made was the Alfa Romeo 33 Stradale. I think a big part of it was how rare they were, how hard it was to find even pictures of them, nearly impossible to find video. And that’s what makes this such a treat, getting to hear the car’s eight velocity stacks breathe in to a little 2.0-liter V8. I can’t help but love small-displacement multicylinder engines, and if you listen to this one bark, I think you’ll understand why. 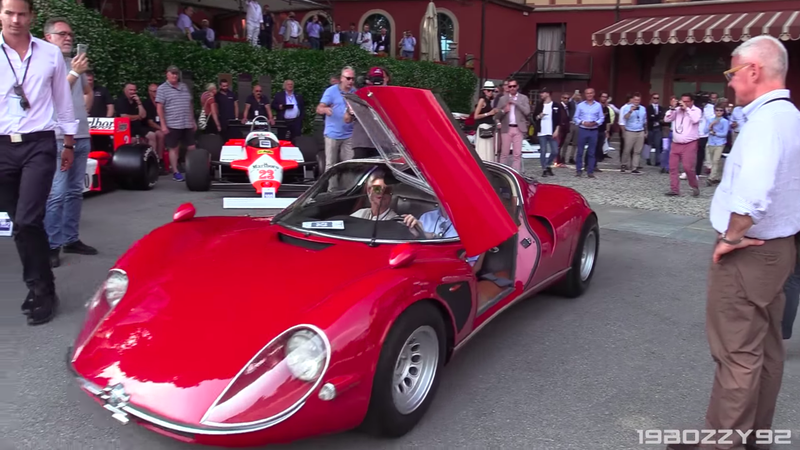 This was at the Concorso d’Eleganza Villa d’Este over the weekend, giving us a good look at the car in motion. Nothing quite says “no air conditioning” like driving around with the door open. Also, look at those black boxes around the velocity stacks. Those are covering up the car’s infamous SPICA fuel injection lines running to each velocity stack. What a joy.